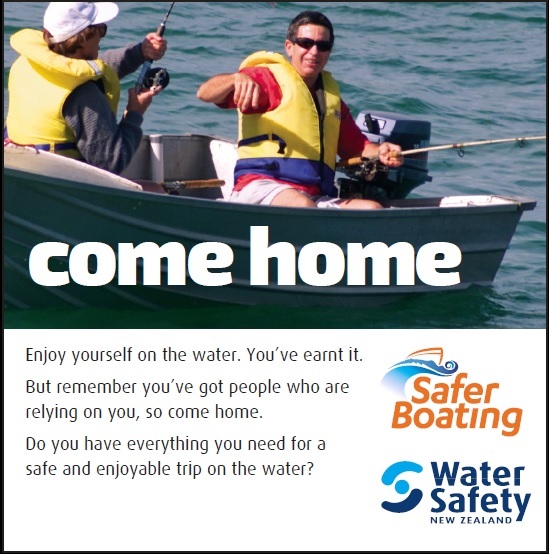 Whether you’re into fishing, sailing, diving, cruising or just having fun, boating safety awareness is essential. Many boating tragedies are caused by an error in judgement relating to equipment, the weather or behaviour. Make sure you keep out of trouble by knowing the environment, having the right equipment on board and acting responsible at all times. Boats, especially ones under six metres in length, can sink very quickly. Wearing a life jacket increases your survival time in the water. The skipper is responsible for the safety or everyone on board and for the safe operation of the boat. Stay within the limits of your vessel and your experience. A true story courtesy of Maritime New Zealand. A VHF radio saved the lives of three boaties when their boat capsized. Carry at least two waterproof ways to call for help - VHF radios and distress beacons are great options. Learn more: http://www.maritimenz.govt.nz/vhf. Even though no licence is required to operate a pleasure boat in New Zealand, ignorance of any Maritime Rules or Bylaws is not accepted as an excuse. Failure to comply can lead to fines or prosecution. Coastguard Boating Education is New Zealand’s leading provider of recreational boating courses. There are courses for all levels of knowledge and ability, including the Day Skipper course, which should be completed by anyone in charge of a boat. Original generation time 1.2870 seconds. Cache Loaded in: 0.0006 seconds.